You can never be quite sure where you are with this book, and where anything in it is with itself. Once a statement is made or a place identified, the words creep back up on the certainty of it and start digging rock from under its foundations. Is the China of the journey an historical one or a metaphorical one? The genius of Segalen is that there probably is no answer and it may not even matter if there were. You can be sure he has been to these places, but far from certain whether he could ever be satisfied with any destination, let alone a description of it. He champions the “li” as his unit of measurement: “it increases or contracts according to the walker’s requirements”. Yet, there is nothing airy about the prose here. 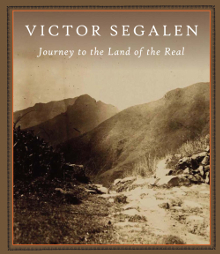 Segalen thickens it with the phenomenology (“Every step is a stride into air, each marked by a repeated slap in the face”) of walking; he nails the agony-pleasure of walking downhill after the long climb to the summit: “thighs become shock absorbers. Arms swim with the fitful motion of a waterfall”. It is hard to believe that Werner Herzog made ‘Fitzcaraldo’ without having read here of the hauling of a boat against the flow of the river: “all the meaning of the river is there.... the turbulence of thousands of tiny struggles, both in the heart and on the boat, each one conquered, again and again, without end”. When he avoids the binary of origins and destinations, and tired conceptualisations of “virgin territory”, and embraces “Difference” as fundamental, Segalen’s book is about a crash, about the accident that happens when a body sets out on the road and a meeting of two worlds take place: “between what one thinks and what one collides with, between what one dreams of and what one does”. After reading Journey to the Land of the Real, it is hard not to consider both worlds as equally real as that repeated slap in the face.